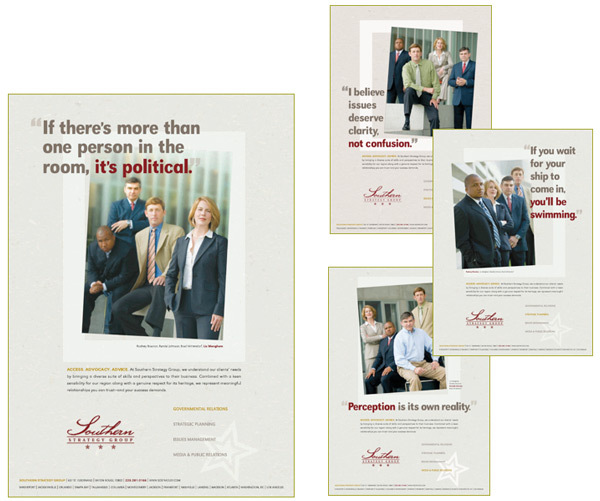 Develop an advertising campaign that capitalized on the [unique] character of Southern Strategy Group (SSG) in order to change assumptions about traditional lobbying and purposefully position the firm as a new breed of governmental relations professionals who provide both brains and personality in addition to a range of services. After only 2 ½ years in business, SSG had established a positive reputation in the marketplace among its peers as a fresh, smart and effective governmental relations firm. However, they struggled with a certain degree of “corporate anonymity”—many knew them generally but did not associate them, specifically, with the firm. In addition, they wanted to promote their other service offerings. Collaborate with design team on concept, photography and layout.